Courage and Grace offers a unique memoir of the Second World War, written in the form of a polyphony— a chorus of voices that reverberate with each other, highlighting their differences in experience and points of view. The author recreates a gripping and suspenseful mosaic of daring escapes, concealments, and acts of valor, portraying the struggle for survival in the face of a living nightmare. 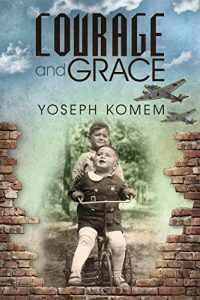 Courage and Grace tells the story of Yoseph and Itzhak Komen, two young Jewish brothers hiding under fake Catholic identities in the Aryan side of a Polish town during the Holocaust. This book tells their fascinating testimonies, but also the true accounts of their parents and others who had to hide from the Nazis. And also life after the Liberation: in an orphanage, in a boarding school, and eventually settling down in Israel. This is an unique memoir, deeply touching, moving, thought-provoking, told by various different voices who together wave an intriguing tale of courage and grace, of survival in the face of perilous odds, of never giving up. Each time I read a book about the Holocaust, my heart breaks, seeing so much innocence shattered, so much hatred and despair. Yet, these books also give me hope and courage, because humanity is strong, and humans don’t break easily, and despite going through horrors, people manage to find their humanity again. This book is strong and powerful, and reading about the young boys’ struggle to survive was heartbreaking. Despite that, it deserves to be read and reflected upon, so we remember the atrocities of war and continue fighting for a better world, a peaceful world, where fights are settled with diplomacy and compromises rather than taking up arms.